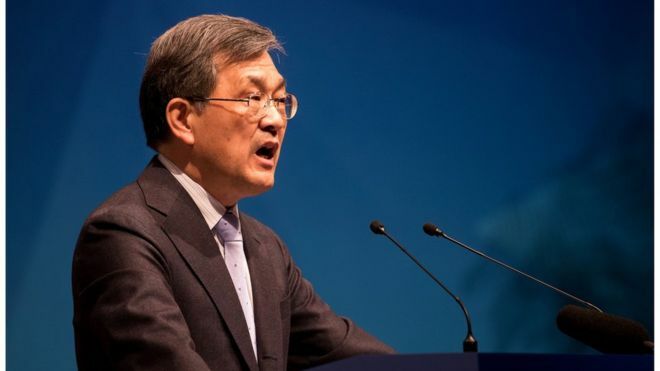 Samsung Electronics chief executive Kwon Oh-hyun has resigned citing an "unprecedented crisis". It is the latest management upheaval at the firm after the heir of the entire Samsung Group was imprisoned for corruption in August. 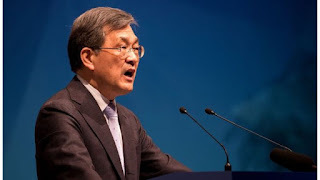 Mr Kwon is one of three co-chief executives of Samsung Electronics. His resignation comes on the same day the firm forecast record quarterly profits, citing higher memory chip prices. Mr Kwon said he had been thinking about his departure "for quite some time" and could "no longer put it off." "As we are confronted with unprecedented crisis inside out, I believe that time has now come for the company [to] start anew, with a new spirit and young leadership to better respond to challenges arising from the rapidly changing IT industry," he said in a statement. He will remain on the board of Samsung Electronics until March 2018. Ryan Lim, founding partner of the Singapore technology consultancy QED said "Samsung is in a leadership crisis situation". Mr Lim said "the current management structure seems to be a complicated web that does not clarify, but rather confuses". "This needs to be resolved soon as it can be worrying not to know who is truly steering the Samsung behemoth into the future," he said.